Colorado's national parks celebrate the Rocky Mountain habitats of North America, from mountain meadows to arctic tundra and glaciers. The parks feature a wide array of wildlife and plants, as well as deep canyons which cut 2,000 feet into the earth's crust revealing rock formations laid down over a billion years ago. The parks in Colorado also feature a huge variety of human and ancient history, ranging from prehistoric Native American villages, cliff dwellings, and rock art, Eocene and Jurassic era fossils, and the artifacts of historic legends like John Otto, John Gunnison, and Adeline Hornbek. Every year, over seven million people visit the 16 national parks, historic sites, trails, and monuments in Colorado. 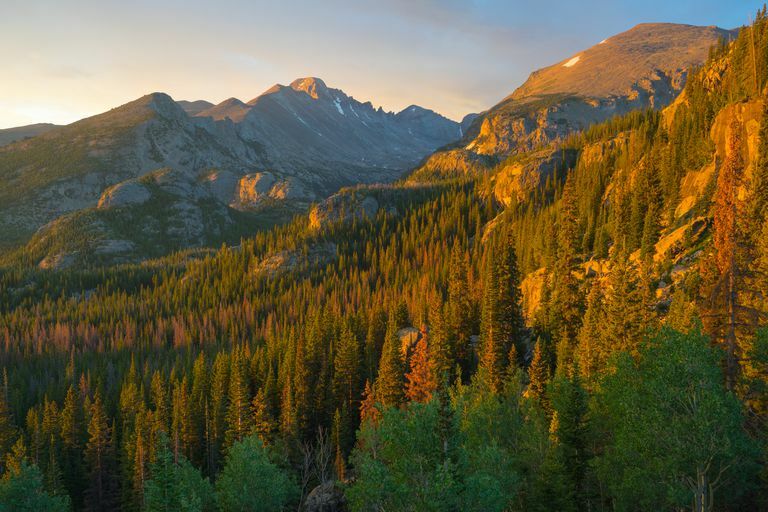 This article highlights the most important national parks in Colorado, as well as their most relevant historical, geological, and natural treasures. Located on the Gunnison River on the Colorado Plateau near Montrose, the Black Canyon of the Gunnison National Park is named after John Gunnison, an adventurer and explorer. Gunnison led the doomed Stansbury Expedition to the river in 1853—most of the group, including Gunnison himself, died in the canyon. The canyon is over 2,000 feet deep in several places, and its sheer cliffs and soaring walls are simply stunning to the senses. The canyon cuts through 2 billion years of the earth's history, exposing the Precambrian layer in its base levels. Along with pinyon/juniper forests, oak flats, and a riparian environment along the river, the canyon includes rare pothole ecology, where ephemeral pools in shallow depressions support a range of organisms in the harsh climate. At elevations between 7,800 and 14,000 feet above sea level, Rocky Mountain National Park contains 60 mountain peaks, a trail that follows the Continental Divide, and the source of the Colorado River. 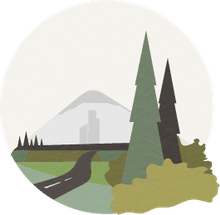 A total of 415 square miles of mountain environments include 300 miles of hiking trails in a wide variety of ecosystems, from large meadowed valleys and slopes to alpine tundra and glaciers. Numerous historic buildings are scattered throughout the park, dated to the park's Depression-era construction, including 10 backcountry rustic cabins built between 1914 and 1935. A wide range of animals and plants can be found here, including endangered species such as the Canada lynx, Mexican spotted owl, North American wolverine, and Greenback cutthroat trout. Established in 1906, the Mesa Verde National Park has nearly 5,000 known archaeological sites, including 600 cliff dwellings, some of the best preserved archaeological sites in the United States. Between 600 and 1300 CE, Ancestral Pueblo people built pithouses, masonry towers, farming structures, and spectacular cliff dwellings, such as Spruce Tree House. The dwellings were all built in the 1190s, and they range in size between one room storage units to villages of more than 150 rooms. A research center and Chapin archaeological museum are resources for Mesa Verde's ongoing studies. The tallest dunes in North America can be found in the Great Sand Dunes National Park and Preserve. In addition to the 30-square-mile dune field, the park encompasses a diverse landscape of grasslands, subalpine meadows and woodlands, riparian and wetland areas, bristlecone pine forests ("krummholz" or "crooked wood" in German), alpine lakes and tundra. The "Saa waap maa nache" ("sand that moves" in the Paiute language) is an important place for several Native American tribes that live in the four corners area, such as the Tewa/Tiwa speakers along the Rio Grande, whose legends include the "Sip'ophe," a lake entrance to the underworld, somewhere near the Sierra Blanca massif in the park. Over 250 species of birds reside in the park, including sandhill cranes, peregrine falcons, rosy finches, and white-tailed ptarmigans. Situated near the town of Fruita, the Colorado National Monument has a wide variety of ancient terrains created by the exposure of Precambrian, Triassic, Jurassic, and lower Cretaceous rock formations laid down between 1.7 billion years and 140 million years ago. Ecozones within the park are primarily pinyon-juniper woodland, with areas of sagebrush, yucca, cactus, and mountain mahogany. Mule deer, coyotes, mountain lions, raptors such as golden eagles, and red-tailed hawk make their homes here. The park was established by President Theodore Roosevelt in 1911, and its first custodian was the eccentric John Otto (1870–1952). Otto, known as "The Trail Builder" or "The Hermit of Monument Park," was a tireless advocate for the park and worked with and designed the first automobile road through the monument, known as Serpents Trail. Curecanti National Recreation Area, located near Gunnison, consists of three separate manmade reservoirs on the Gunnison River, lakes high in the Rockies where Kokanee salmon and catch-and-release rainbow trout fishing and ice fishing are available. The first human occupants of Curecanti lived here 10,000 years ago, and historic period Ute tribes summered in the mountains and wintered near what is today Monstrose and Grand Junction. A narrow gauge (three-foot) railway called the Denver and Rio Grande Railroad made its way through the canyon in 1881; and at the western end of the route was the town of Cimarron, where railway exhibits include authentic cars from the period. The Dinosaur National Monument is located on the northern border of Colorado, near Vernal, Utah. The monument is named for the 1,500 Jurassic dinosaur fossils found there. Examples of Allosaurus, Apatosaurus, Camarasaurus, Diplodocus, and Stegosaurus can be seen in the exhibit hall built over the Carnegie Quarry, where they were found. The park also features mountains, deserts, and rivers in deep canyons, and there are several locations with concentrations of Fremont culture rock art. Fremont culture people lived in Colorado, Idaho, Utah, and Nevada between 600–1300 CE. Their petroglyphs and pictographs were carved and painted onto sandstone cliffs in contrast with the dark desert varnish, and illustrate human and animal figures, as well as a wide range of abstract designs. Florissant Fossil Beds National Monument, located in the Florissant Valley near the town of Florissant, combines a rich paleontological resource with 19th century homesteading history. During the late Eocene 34 million years ago, the valley was a lake, and petrified redwood stumps from that period are still seen along the trails. Detailed fossils of plants, mammals, birds, fish, and insects found in the park are on display in the visitors center. An active research program houses visiting scholars and more than 10,000 fossils. Members of the Ute Nation were living in the region when the European homesteaders arrived, and many still live in the area and visit frequently. The Hornbek Homestead is an 1878 homestead built by Adeline Hornbek, a woman who defied gender norms to live on her own in the mountains. Near Cortez, Colorado, Hovenweep National Monument contains the ruins of six prehistoric villages built by Ancestral Pueblo people between 1200 and 1300 CE. Hovenweep's name means "deserted valley" in the Paiute/Ute language, and it was adopted for the ruins found there. The masonry structures housed at least 2,500 people, and they include square and circular towers, D-shaped apartment blocks and many circular ceremonial buildings called kivas. Many of the towers are in out-of-the-way places, perched on canyon rims or balanced on boulders, and scholars can't say why for certain. Possibilities are that they were used as defensible storage silos, astronomical observatories, or watchtowers.